Note: if you just want the technical specifications of the board, see this page. I can’t believe it’s already been over ten months since my previous update. Time does fly when you’re combining two jobs with an as normal as possible social life, apparently. Since my previous posts, a lot of people in the comments, mails and on the PJRC support forums have asked me when the Teensy adapter board will be out, if ever. Truth is, the hardware was as good as finished and ready for production if it wasn’t for the bidirectional level shifters. I placed these on the board to perform bidirectional level shifting between the 3.3V Teensy and 5V Arduino shields. Unfortunately, the TXB0108PWR level shifters aren’t functioning as straightforward as the datasheet wants you to believe. When not all the pins on one side are on the same potential, the pins on the other side start acting strange. Pins that should be at a low logic level float around 3V, the edges of the output signal are skewed, there’s signal noise etc. After ensuring this odd behavior wasn’t due to my PCB design (by testing the TXB0108PWR ICs directly), I had a lengthy discussion about it with some TI engineers. It didn’t lead to a workable solution. You can’t expect all the pins on one side to be on the same potential, because Teensy users will want to mix and match input and output functions. So I was left looking for an alternative solution, but my other occupations (like writing a PhD and running a small software company), soaked up all my available time. Then some time ago, Paul from PJRC released the Teensy 3.1 using the MK20DX256 chip instead of the MK20DX128. This chip brings, together with some other nice features such as simultaneously sampled ADC’s and more memory, 5V level tolerance to the table (or should I say: board). This kinda rendered the use of level shifters void. You can directly apply 5V outputs without damaging the chip, and you can drive 5V TTL inputs with the 3.3V output of the chip. My first idea then was to make a revision to the board removing the level shifters, but maintaining other functionality such as the analog scaling. Bringing such a board into production wouldn’t be feasible economically however. In small quantities the board would have to sell around €20 to cover all expenses, so it would cost more than the Teensy 3.1 does! My second idea then was to just integrate the Teensy into the board. The biggest production cost is actually the PCB and not the components. By putting the MK20DX256 and the Mini54 bootloader chip onboard, the board would gain a lot of functionality without increasing the cost much. I decided to pursue this idea further, and nicknamed it the TAX board: Teensy Arduino crossover (X) board. TAX does pretty much the same as the previous board, but now without having to solder a Teensy on to it. The digital inputs are 5V tolerant thanks to the MK20DX256 chip. The analog inputs have the same 5V/3.3V voltage divider and retain the buffering opamp resulting in good signal quality and improved speed over regular voltage dividers. A bonus is the onboard 3.3V voltage regulator, providing a clean supply voltage instead of the sometimes noisy voltage rail on the Teensy board. It also has a higher power output of 750mA. For programming, a USB type B receptacle is used instead of the micro-USB found on the Teensy, giving the board the looks of an Arduino Uno. Some people were complaining about the micro-USB receptacle wearing out pretty fast, but the type B is more robust. Plus you can use all of your Arduino cables! Some extra pins of the MK20DX256, like the DAC, are tied to an extra header (placed where you would normally find the ISCP header for the USB to serial converter on an Arduino Uno). The dedicated serial header, compatible with the most FTDI boards floating around the web, is present again. You can also power the board through this header. Talking about power, TAX has an automatic power selector circuit. You can now safely power it by supplying 5V through a header, using a 6-16V power supply connected on the DC barrel connector or by connecting a USB cable. The selector circuit will automatically select one power supply if more than one is connected. I have build a number (four, to be exactly) of prototype boards to test functionality. After a few weeks of testing, everything seems to be in order. The boards behave just like an ordinary Teensy or Arduino would, so that’s good. 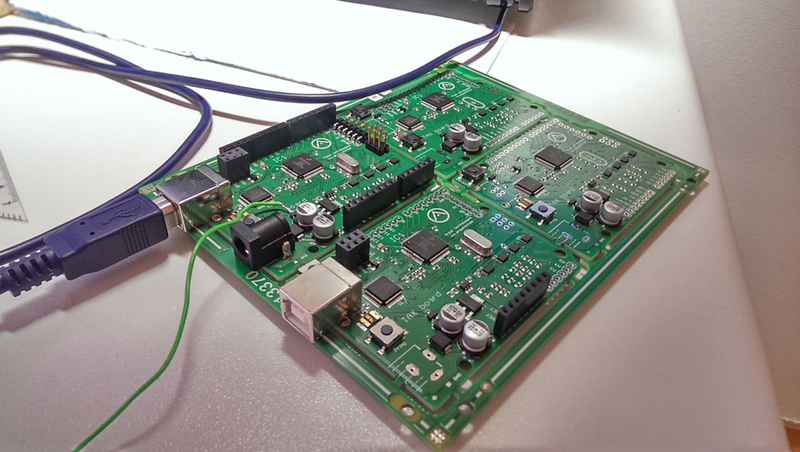 Currently (may 2014), a new batch of prototype boards is at the PCB fab. I did some minor routing and pin changes of which I want to be sure it works flawlessly. I expect to have the testing done in a week or four. Response to my previous adapter shield has been great, so I hope this new version will be able to captivate the same enthusiasm. I think the potential is big enough to put it in limited production, so be sure to check in on this blog for further updates! Also, please leave your comments and feedback in to the comments section. It’s important to know what you guys think and where I could improve the design. Even better then the teensy 3.0 shield. I am seriously interested in acquiring these boards. 30EU/board is not an issue. That’s an iniogneus way of thinking about it. I too am very interested in getting one or two of these boards. I will glady test one or two of your protypes if they are available. Wish all the pins on the processor where available. Maybe the next version could have a layout similar to the arduino Mega 2560. Question: Is I2C only available on A4 and A5 with pullups enabled or is it also available on the other pins next to the aref pin? I am just getting started with Arduino but this looks great. I have done hardware and software design years ago and am looking to get back into it now that I have the time. I have put you on my calendar to check back at the beginning of Oct to see if they are ready to go. Best of luck! I too would like to purchase one or two of your Teensy-Arduino Crossover (TAX) Shields. Please email me if they are available for purchase. I’d like to buy one, and then I guess some tax shields, because arduino power in now to few for my projects, but I must keep the form factor, can you sell some? I am surprised that (I see) only one reply indicating interest, but I am very interested. The suggested price is not an issue for me at all. What is the current status of TAX board? I’m interested in a couple. If your project is on hold, will you share a schematic? I would like to buy some of these too. please inform me, it they will be available. It’s been a while since your post, so ignore this if the moment has passed, but if you are still considering a run of these for sale, I’d like to get a couple. I would be very interested in this also. 30EU is not a bad price for what you get. Good luck. Let me know if/when/where I can purchase these. Keep me posted on availability? Many thanks for your time and effort seeking practical improvements to allow the technology to better suit industrial applications.